O praise, honor, and duty. And truth is one with beauty. The Alessian Order was a hugely influential religious sect in the First Era which preached strict monotheism. The Order arose in the coastal jungle of what is now Colovia, where a prophet named Marukh, who had spoken to the "Enlightened One" Saint Alessia, began to question the validity of elven rule. These sentiments led to increasingly abstract and unknowable depictions of a one true God, though they tolerated the worship of polytheistic pantheons as well. The divine aspects worshipped by the various humans and Aldmeri became many of the saints and spirits of the evolving Alessian canon. In some places, they replaced the existing belief system with something more mutable, as in eastern Cyrodiil, where the traditional Nordic version of the Eight Divines was purportedly replaced by a "baroque" veneration of ancestor spirits and god-animals. They first gained footing in the lower classes of the Nibenese, and in 1E 361, the inexplicably charismatic Order became the far-reaching and powerful theocracy of the Alessian Empire, enforcing their doctrines throughout it, and their influence on Tamriel has been immense ever since. At its peak, the influence of the arch-prelate of the Order was nearly equal to that of the Emperor himself. Eventually, however, the Order collapsed as a result of the War of Righteousness in 1E 2321. The Order was very austere and severe, and life under their rule is remembered for its cruelty and lack of entertainment. Heartlanders of Cyrodiil remember their rule as a dark age. A sect of the Order, the Marukhati Selective, is said to have caused a Dragon Break spanning one thousand and eight years by attempting to exorcise elements of elven Auri-El from Imperial Akatosh. It's worth noting that one school of thought dismisses the whole idea of the "Middle Dawn" as scholarly error, and asserts that the Alessian Order only lasted about one hundred fifty years. The Alessian Order followed the Alessian Doctrines. The "Seventy Seven Inflexible Doctrines" began as legal codes written by Marukh following his "Century of Penance" in the Stonemeadows, whereupon he claimed to hear the words of the shade of Alessia during a tortured delirium, and he wrote them down in his own blood. He eventually came to the epiphany that death is an illusion, and through devotion to "Proper-Life and Ehlnofic Annulment", the "Arkayn Cycle" can be conquered. His code famously stated that "all are guilty until they have proven themselves innocent", which is still a guiding principle of the legal system in Tamriel. The Doctrines forbade "trafficke with daimons", without actually defining "daimon". His preachings evolved into religious codes which became the guiding principles of the Alessian Reformation of Marukh, which led to the proliferation of the modern Tamrielic pantheon of the Eight Divines. Above all, the Doctrines were notorious for being firmly opposed to the elves, particularly the Ayleids. Though the Alessian Empire was founded in 1E 243 following the fall of the White-Gold Tower, Ayleids continued to reside in modern-day Cyrodiil, often as vassals of the Empire. Continuing resentment towards them was one reason why the anti-elven Order proved to be so popular. They began sacking Ayleid settlements in the early 1E 300s, and in 1E 361, their Doctrines took on the force of law throughout the Empire. The Order was responsible for the sacking of Malada, an important Ayleid temple, in 1E 393. In accordance with their scriptures, the Order tirelessly ferreted out and destroyed elven writings within their domain. They recognized no difference between religious and political matters, and taught that to resist the Emperor is to resist the Divines. The Alessians earned many enemies. Their rise to power in Cyrodiil soured relations with the Camoran Dynasty in Valenwood, who had initially established cordial relations with the Empire. The First Empire of the Nords, not to be confused with the Alessian Empire, was at various times receptive and resistant to the Order. The Nords in particular were resistant to Alessia's compromise due to its incorporation of elven beliefs with their own. Unlike the other descendants of the Nedes, the Nords had not adopted elven beliefs, as they had not known elven rule (at least, not since the Dawn Era, when the elves were driven from Atmora). Nevertheless, High King Borgas of Skyrim became a significant ally of the Order, but he was killed by the Wild Hunt for the "iniquities" of his Alessian faith (he was on his way to Cyrodiil at the time to advocate for a joint war against the elves). 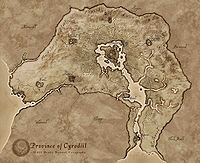 Many of the Ayleids the Order drove out of Cyrodiil were absorbed by the Bosmer in Valenwood and the Direnni clan of elves in High Rock, so the strengthening of these groups over the ensuing years could be attributed to a bolstering of their ranks by Ayleid refugees (though the subject remains little studied by scholars). The Order became a victim of its own success. The priesthood, spread as it was throughout the regions of Tamriel, developed schisms over time. Though the movement had started in Colovia, heavy Nordic influence, as well as concerns about the hostile Ra Gada in nearby Hammerfell, created a buffer in western Cyrodiil against the influence of the Alessian priesthood which had emerged to the east. Resistance to the Alessian Doctrines in western Cyrodiil eventually led to the formation of an autonomous government for them, the Colovian Estates, which set the stage for the downfall of the Order. The Alessians were no strangers to suppressing rebellions, but when western Cyrodiil, led by Rislav Larich, successfully broke away from the Empire in 1E 478, it spelled the beginning of the end. The Direnni pressed their advantage in High Rock, banning the Doctrines, and the Alessians ultimately couldn't recover from several military defeats, notably the Battle of Glenumbra Moors. Neither the Direnni nor the Alessians won High Rock; it was eventually the Bretons who rose up to claim their own land. Wulfharth's first act as High King of Skyrim in 1E 480 was to ban the Doctrines. The Marukhati Selective (also spelled Maruhkati) was an elite sect within the Alessian Order. Their beliefs are summarized in The Exclusionary Mandates. Due to their intense devotion to singularity, they considered all their beliefs equally important and crucial. They believed that the linear nature of time demonstrated that Akatosh is (or at least, should be) of a unitary essence. They asserted that Shezarr is "Singularly Misplaced and therefore Doubly Venerated", that "Proper-Life" as enunciated by Marukh is fostered by "monothought", and it serves to expunge the "Aldmeri Taint". They believed it was necessary to act in the mortal realm to achieve their divine goal to expunge this taint, and that "Akatosh is Time is Proper-Life is Taint-Death". In Vindication for the Dragon Break, Fervidius Tharn (who became Arch-Prelate of the Selectives in 1E 1188) summarized the Mandates by stating that the goal of the Selectives was "to reverse the error of Sanctus Primus and restore Ak-at-Osh to humanadic purity". Every culture on Tamriel remembers the Middle Dawn in some fashion, mostly as a time of unaccountable spiritual anguish. Several texts survive this timeless period, all (unsurprisingly) conflicting with each other regarding events, people, and regions. Some say certain wars happened, some say the gods walked, and some assign a certain color to the sun. But almost always, sources seemed to contradict each other. Whether or not the secret masters of the Marukhati Selective were successful is unknown, and any records of their survival were destroyed by the War of Righteousness that ended the Alessian Order a hundred years later. [UOL 2] The only thing all cultures consistently agree upon is that, one by one, eight stars fell from the sky. Much like their prophet, the Alessian Order seemed to refuse to die. They apparently survived for almost two thousand years (though, as noted above, some scholars raise issues with the timeline). They are said to have spent much of the First Era fighting the Direnni for control of High Rock. The Bretons eventually joined the Alessian Empire during the reign of Empress Hestra in 1E 1029, but they seceded almost a thousand years later due to the "excesses" of the Order. An attempt to bring them back into the Empire in 1E 2305 ended poorly for the Alessians. The Alessian Order would never again be what it once was. When the War of Righteousness broke out in 1E 2321, the Order which had almost ruled the world finally undid itself in a ten-year span. During this war, their great monastic complex at Lake Canulus was razed. The exact length of the Seventy Seven Inflexible Doctrines is not known, but some sections are considered quite banal. Mannimarco, the King of Worms, alleged that it was the High King of Alinor who was responsible for the Dragon Break "in the first place". However, Mannimarco immediately also credits the Selectives for the Middle Dawn, so it is unclear what role he claims for the King. ^ Legal Basics — Anchivius, M.Z.F. ^ Wulfharth's plaque in Windhelm. This page was last modified on 4 January 2019, at 15:37.